Data Rights Finder is a new service designed to help you take advantage of the data rights gained from the General Data Protection Regulation (GDPR). It cuts through the mind numbing jargon in leading company privacy policies so you don’t have to. Want quick, clear answers about how a company stores your data, or whether they share it with third parties? Need to know exactly who to contact to make a subject access request? Data Rights Finder has answers. Blocked! allows you to easily check if your own (or any) website is being mistakenly blocked by default filters on major UK Internet Service Provider (ISP) broadband and mobile networks. If you identify any wrongful blocks (there are a shocking amount of these), Blocked! lets you submit an unblocking request with just a couple clicks. You’ll learn how to check local websites and help document and expose the damage done by algorithmic filters that rampantly overblock and damage free speech. Laptops are recommended but not necessary. All are welcome to this FREE event. Please join us! Could new plans to make Britain “the safest place in the world to be online” have unintended consequences? Hear from ORG campaigns manager Mike Morel and legal officer Alex Haydock about how the Government is working with social media companies to police online speech. Learn how heavy fines encourage the use of not-so-smart filters that can silence free speech, and how murky definitions of ‘harmful content’ give social media companies unprecedented control over free expression. No experience is necessary to attend this FREE event. All are welcome! Manchester NO2I are having an informal pub social meeting for a general chit-chat and to discuss the latest developments with the database state and mass surveillance. Manchester ORG members and supporters are of course welcome to come along for a drink and chat. To be followed by a panel featuring the Open Rights Group and the National Union of Journalists. All this is on April 22nd at 2pm in the Three Minute Theater. The day of events at Manchester Central library kicked off with storming introductions to working with WikiData as well as an over view of the ‘open data’ movement itself. We all enjoyed some of the little games you can play on the WikiData site in order to improve it for everyone. After a great lunch, it was on to a series of talks about protecting your own data, including useful browser extensions to install. 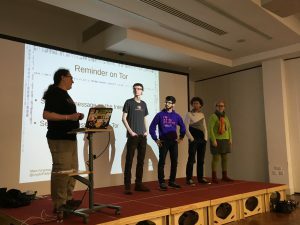 We also played a few games to explain things like Tor in a fun way, before breaking off into groups and helping people make the improvements they wanted to make. Last weeks highly entertaining talk was full of tales of how the Department of Education misleads on answering questions about it’s plans for pupil data, such as by failing to make clear that the collection of nationality information is entirely optional! We learnt of the scale of the problem, with over 20 million kids involved, and anyone under the age of around 36 being on the database too. This includes things like exclusion records as well exam results. There are obvious issues with using exclusion records to blindly make decisions; children take the rap for others – but now have unknowingly created a black mark on their employment record ! There was a good discussion of how both DefendDigitalMe and Open Rights Group share some of the same issues with campaigning; for instance there have been numerous main stream press articles, but no one in the audience had seen any of them! DefendDigitalMe’s next step is going to be a campaign for people to make Subject Access Requests to see what is really happening – and there were some funny stories from the speaker about when she found out she has someone in the DfE who regularly reports on her tweets ! If you have any questions, they also have an excellent National Pupil Database FAQ. We’re delighted to have DefendDigitalMe talking about the National Pupil Database and child census projects on March 1st. This event is a great opportunity to discover how new technologies are changing our communities. With talks from local campaign groups, technologists and academics, this event will give you the chance to engage with pertinent issues: How is technology changing the ways we live and work? Which new innovations are soon to transform our communities? In what ways can new technology empower our communities? Come to ‘Digital Activism’ to find out more!